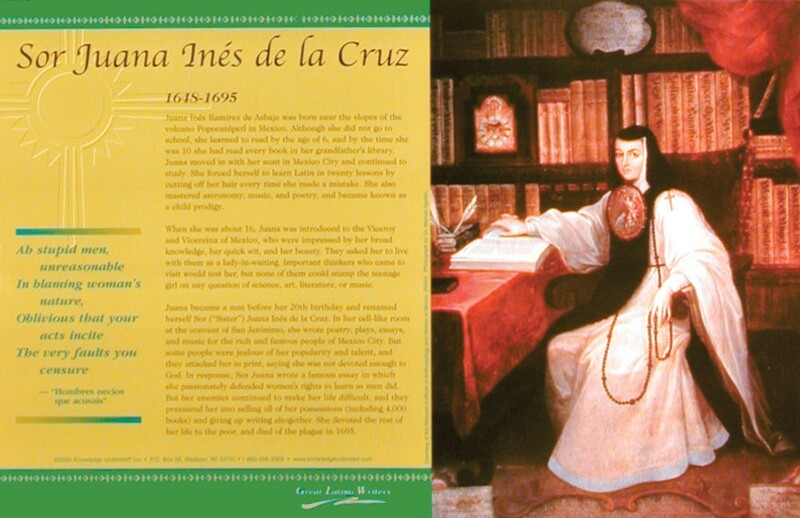 This language arts poster of writer Sor Juana Ines de la Cruz is one of a series that focuses on great Latino writers. 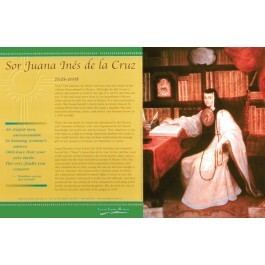 Sor Juana was born in Mexico in 1648. Although she did not go to school, she learned to read by the age of 6. She maintained a lifelong passion for reading, learning, and writing. She became a nun before her 20th birthday and in her room at the convent, she wrote poetry, plays, essays, and music for the rich and famous people of Mexico City. She was attacked by some for not being devoted enough to God. Clearly ahead of her time, Sor Juana wrote a famous essay in which she defended women's rights to learn as men did. But her enemies persisted and pressured her into giving up writing altogether. She devoted the rest of her life to the poor. The poster features an artistic depiction of Sor Juana, biographical text, and an excerpt from one of her poems, "Hombres necios que acusais."